Just replaced a number of the older fittings on the boom with new fittings. I am not sure how old these fittings are but a number of the blocks didn’t turn at all so they needed replacing. Ronstan claims that there new fittings are super light. Having digital scales kicking around the garage, I thought it would be worth my while seeing how much difference there is. 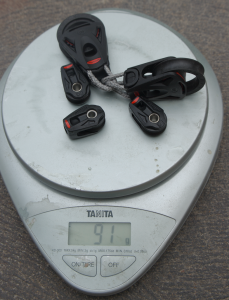 The new fittings are only 91 grams, so a 144 gram savings. While I didn’t do this for the weight saving, it is nice to know that the new fittings are a fair bit lighter. 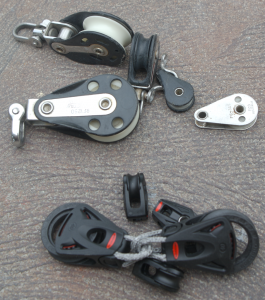 The new fittings save there weight in two ways, one they are made out mainly a light weight plastic instead of metal, and there is much lighter weight ways of securing the fittings to the boat. 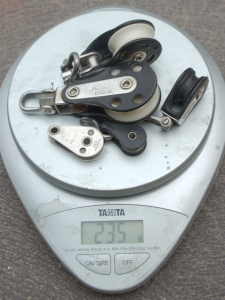 In the case of the main blocks a rope is used, and in the case of the micro blocks (9 grams each) they are attached via spectra running through the centre of the block.